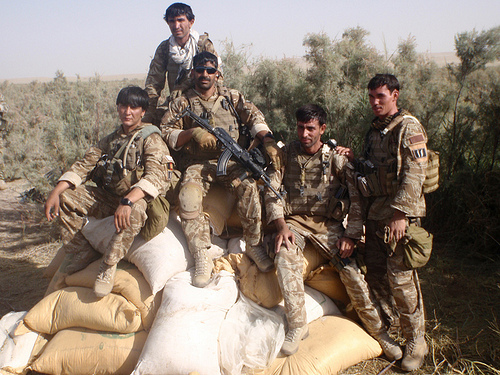 The Afghanistan armed forces have to have the most diverse mix of camouflage utilized on any countries military uniforms at one given time in the course of history. Here is a shot of some Afghan Forces sitting on a large stash of highly explosive fertilizer that was seized in the Helmand province. This area falls under the Region Command Southwest with a very arid landscape which fits well with the Desert Disruptive Pattern Material Uniforms. The contributing units that covering this area of operation are largely from the U.S. Marines (including lead commander) and UK forces among other ISAF nations. So, it is no surprise seeing these Afghan soldiers utilizing the camouflage of the British Forces, however in most shots, you see Marines and Soldiers from the UK in the new MTP Uniforms. This begs the question if they are wearing this camouflage as a better match for use in joint operations with US Marines or if they are cast offs from when the UK switched over to the new Crye Multi-Terrain Pattern. The latter is a great option given the major Helmand and Sangin River valleys, which are hotly contests areas for the Taliban combatants. They are clinging to their large scale agriculture rich operations in this region that is the the largest Opium producing area of the world. With largely arid terrain, the British Desert DPM seems like a much better alternative to the Afghan Forest Digital or Woodland camouflage pattern worn by most in the Afghan National Army.